It's wintertime, which means many people suffer from dry and cracked lips. 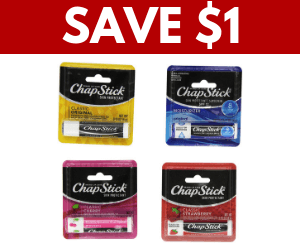 Hydrate your lips and save money with this $1.00 off Chapstick coupon! To get your coupon, simply select it on the offer page. You'll need to log in or create your free account to download and print the coupon. This offer is only available for a limited time, so claim yours now. Be sure to check for an expiry date on your coupon. If you like this offer, be sure to check out another one we posted for a free $5 off Hallmark coupon! Want more beauty savings? Check out all the current beauty offers!